My sewing room and home office are in one space (as well as my husband's computer, and formerly the kids' computer until they left home and I kicked it out!). It's a nice, big room--the bonus room over the garage--but it's pretty narrow and although it's got a nice big picture window at one end, it faces east so I get great sun for about two hours in the morning and then it gets progressively darker for the rest of the day. And let's not even talk about November to March, when we're lucky to get even 10 minutes of actual sunlight in a day. My new lights ended up, just by a happenstance of scheduling, becoming a day-after-birthday gift to me. And what a birthday gift. Note the number of floor lamps and table lamps trying desperately to give me working light. I'm standing right next to my design wall--the darkest corner furthest from all lighting available. Also note how yellow everything is. 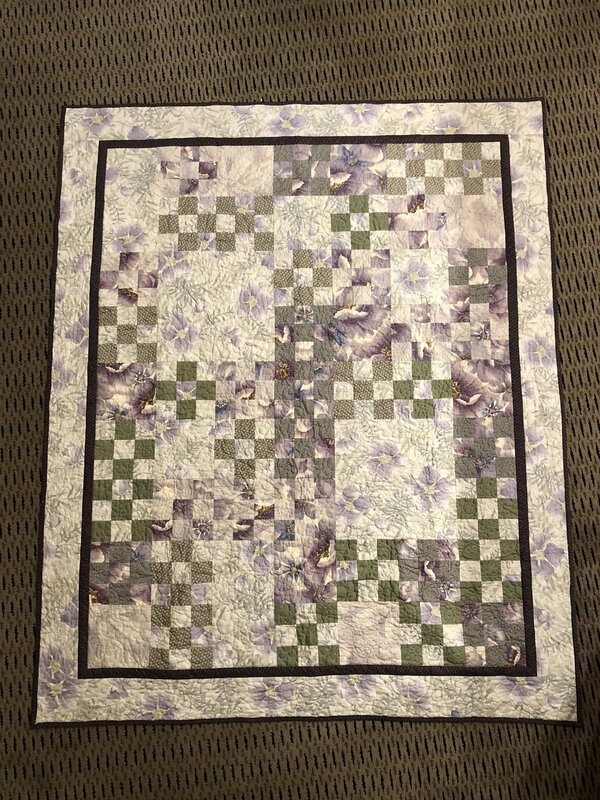 I had an Ott light at my cutting table and would have to pull fabric off the shelves and lay it under the light so I could see what color it really was. Taken later the same day. It looks brighter outside just because it had stopped raining, but it was still just about as gray as it was in the morning. All the light you see is now electric. I had them install bulbs that were as natural-daylight-colored as possible. My fabrics look fantastic. The electrician really worked to figure out the best placement and number of lights to minimize shadowing when I'm at my cutting table. They're "cool" lights so they don't heat the room up at all. And, best thing--there's one right near my design wall. I can see!!!! Woohoo woohoo woohoo!!! Serious happy dances up in here. And, as another happenstance of timing to feel like it's a birthday present to myself, two color wheels I'd ordered from Dharma Trading came today. 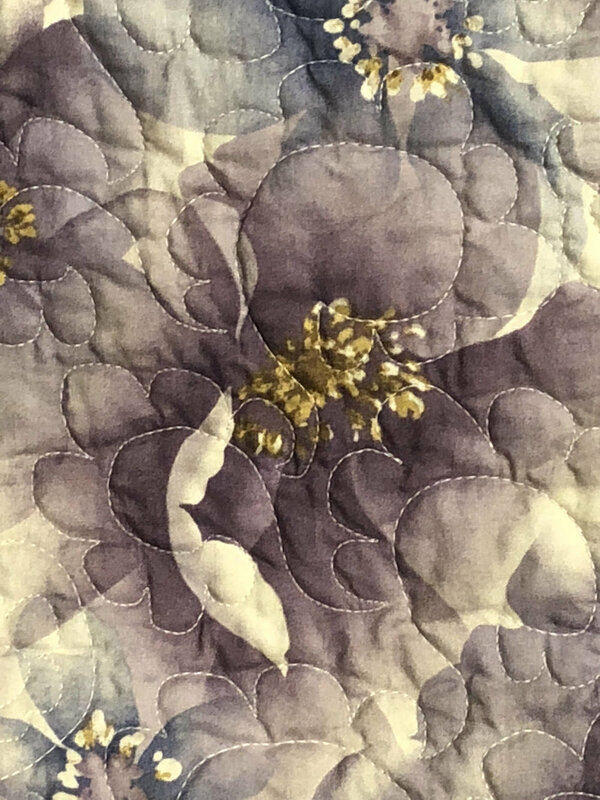 These are designed especially with fabric dyeing and painting in mind. This is a "CMYK" wheel. Some dyes/paints apparently work better if you use the CMYK wheel when figuring out dye combinations rather than the traditional wheel. 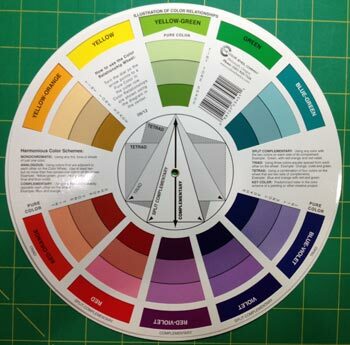 Joen Wolfrom also prefers to use this color wheel in general--her 3-in-1 Tool is based on it. 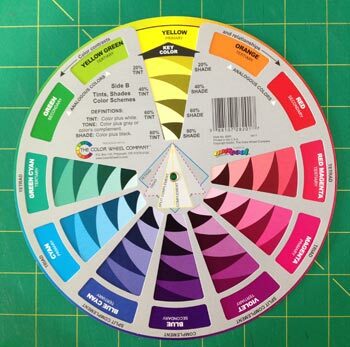 The back of the CMYK wheel has another very helpful tool in determining proportions. Look under yellow. If you mix 80% of the pure color (yellow) with 20% white, you get the tint--which is the lighter swoop on the left. If, on the other hand, you mix it with 20% black, you get the shade, which is the darker swoop on the right. Next one down is 60/40, next is 40/60, and lowest one is 20/80. The graphic in the middle also gives you at a glance what the complement, split complement, triad and tetrads are, plus it shows analogous along each side of your chosen color. The second wheel I got is based on the traditional color wheel, but it has another very useful tool for choosing dye combinations. Look at red, center top. You spin the wheel to see what color you would get if you added the colors at the top of the inner wheel. In this case, I've spun it to show what would happen if you added blue to red--you get the color in the window (which is violet). It may seem straightforward, but it's particularly useful in the tertiary colors. In other words, what's the difference between adding blue to orange, versus adding blue to yellow-orange? It will allow me to more easily fine-tune my color recipes. The back has the tints, tones, and shades again, with the graphic in the middle giving a quick-glance visual of complementary, split complementary, triads and tetrads of any chosen color. So while there are a lot of similarities between these two color wheels, and between these wheels and other ones I'd already owned for quilting, there are some very useful differences for use in my hand-dyeing and fabric painting. I can't wait to get back in my dye studio and play. And yes, my dye studio is also very well lit. 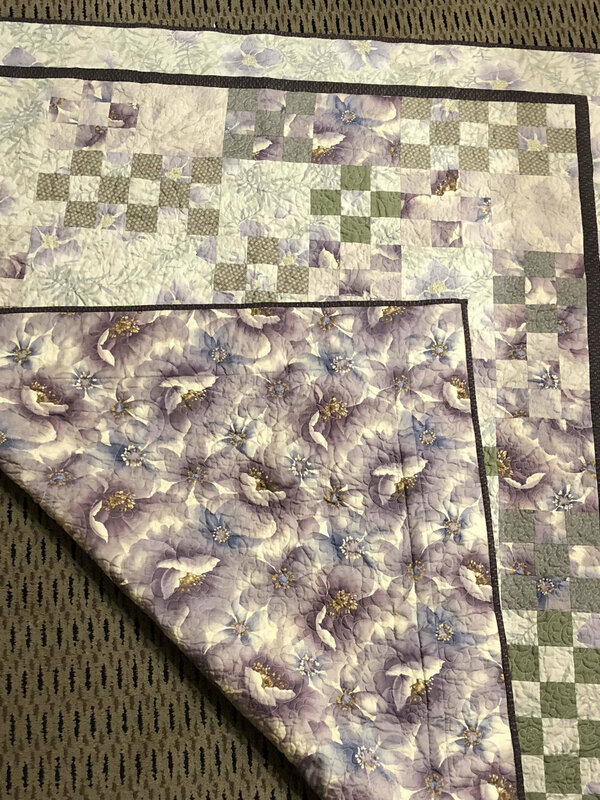 We had them install new lighting in the basement as well and there's a natural-light florescent in the corner where Mad Quilt Scientist lives. All is right in my little fiber arts world! 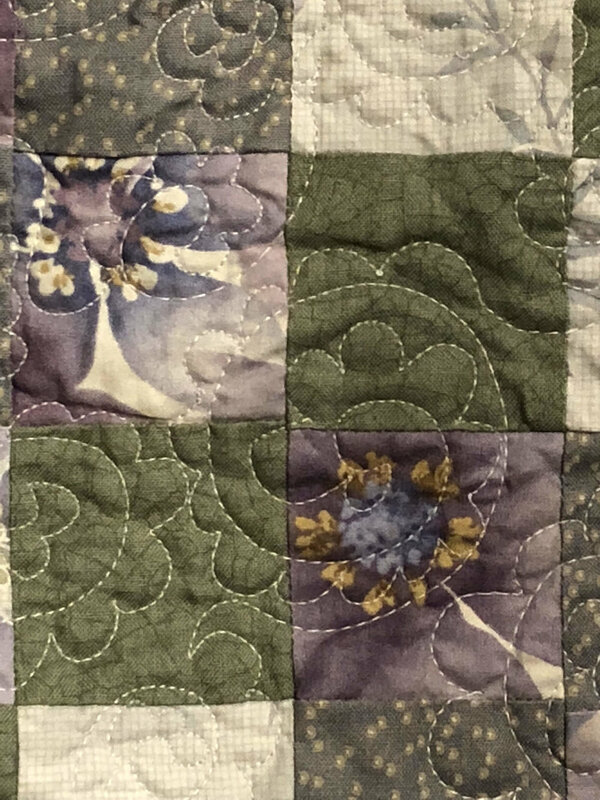 In fact, you'll have some more hand-dyeing results soon--playing with discharges and resists and magnets (Oh My).